I have moved back to Rotterdam. I’m spending a month in the apartment with the rugby team. I feel like I’ve fulfilled a mini-Watson objective, settling down in a place for a month with people who I didn’t know when I left home for a price more reasonable than anything you can get through a commercial enterprise. Plus, it’s a cozy nook and who doesn’t like to have a rugby ball to cuddle with at night? The younger guys on the team call this place the ‘retirement home’ because the residents range from 25-29 (25-62, most players joke). Every elderly person needs a resident nurse though…I think I’m prepared for that role. Coming back to Rotterdam sort of felt like coming home. It’s become familiar. I know the layout and neighborhoods of the city and I have friends here. It would have been cool to try to establish something similar in Amsterdam, but I have the whole year to learn new places. Why get rid of something good once you’ve found it? This morning I had my second visit to the Rijksmuseum to take a closer look at the Dutch master’s paintings in the Gallery of Honor. The first time I went to the museum I wasted all of my energy enthralled in the model ships, medieval weapons, and ornate furniture that I was too tired to take a look at the paintings. I was honestly pretty flabbergasted by some of the detail work in Vermeer’s Milkmaid painting. I wasn’t impressed, or even interested, by his representation of the figure, but his craft depicting the bread, basket, tapestry, and tablecloth is just sensational. He painted the still life on the table with a photographic realism. It was painted in 1658. How can something sustain its clarity for that long!?! I mean..preservationists and art historians but you have to give credit to the man’s skill. The most special part of the Rijksmuseum is seeing 800 years of artifacts organized and time-lined. It’s pretty incredible to be able to see the transitions and tangents the craft of painting went through after the 17th century. And it’s awesome to see early traces of expressionism and very abstract brushwork in work from the 1600s! I’m proud to announce my biggest accomplishment of the week: posting on the Heineken Beer Factory wall of fame for this performance. It was open monument day in Amsterdam yesterday so I joined up with two Bowdoin Juniors, Sierra and Melody, to see some of the canal houses, churches, and the Heineken beer factory. BRFC…congrats on the first season win beating up Bates. It’s quite a trip to think that the Netherlands was once one of the richest countries in the world with a global influence through its maritime trade. Amsterdam was a center for wealth. Walking along the canals you can see clear evidence of this in the elegant townhouses dated from the early 18th century. Saw Portugal. The Man last night. Rock on! They were good, not mind-blowing. But…the lead singer wore a thigh-length raincoat with the hood up for the whole concert. I dig. One rainy afternoon, I passed the Anne Frank House, where the young diarist lived in hiding during the Nazi occupation of Amsterdam. I noticed that the rain had washed the line away. The queue, which usually wraps around the entire block was shortened to just a few people. It was getting dark and I was surprised it was still open, but took the opportunity to take the tour. Now a UNESCO heritage site, the museum Anne Frank House guides you through the hidden annex to see preserved artifacts. A lot remains unchanged. To get up the stairs to the annex, you have to slither through a crack behind a bookshelf and up a steep staircase. A few of Anne Frank’s quotes are elegantly painted in different places around the rooms. There were only a few people around me as I tiptoed through the house in Anne Frank’s footsteps. It was a very ghostly, ominous, and incredibly sad experience. 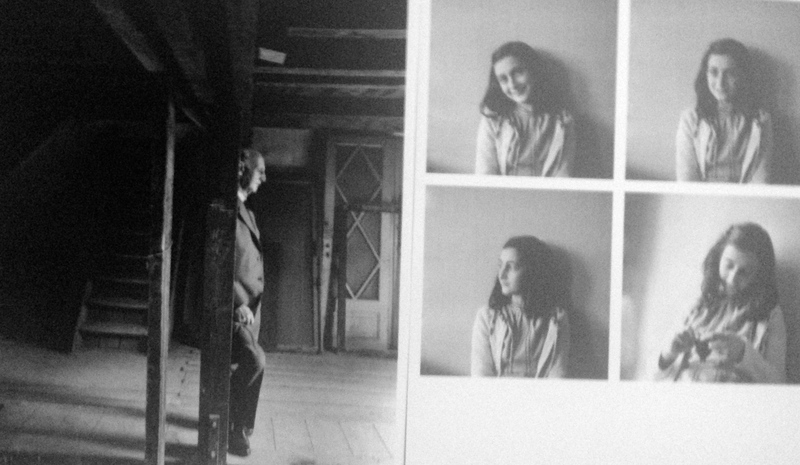 The whole tour had my emotions stirring and tears finally came after I saw video footage of Otto Frank, Anne’s father, describing reading the diary for the first time after he knew his daughter would not be return home from the concentration camps. Here are two postcards I picked up. On the left is Otto Frank revisiting the annex after the war. On the right, the girl who dreamed of becoming a famous journalist. Amsterdam is a really beautiful city. The whole place is so dynamic. Sometimes adjectives sound so cliché. I’ll describe with nouns: Bikes bikes bikes. Music. Trams. Bikes. Beer. Trees. Bridges. Potted plants. Tourists. Museums. Bikes. Pot. Bikes. Red lights. Water. Houseboats. Fearless pigeons. Pigeon runover by bike. Pot. Beer. Bridges. Rain. Bikes. Rain. Bikes. Rain. Music. That wasn’t my ‘experience’ but it describes things you might see and think about if you were a robot walking through the city. It was interesting to see the strains of ‘touristy’ areas that run through it, then rewarding to find the pockets that appeared to be much more authentic. SInce I lived a little ways outside the central canal district, I biked through wonderful local pockets. On bike, I could cover a lot more ground and I think I got a good sense of the city. Amsterdam uses its limited space very efficiently and there are so many funky shops, cafes, restaurants, and bars. It’s the love child of a quaint small european town and a global metropolis. I’m reading about the urban development of the city and the construction of the canals now. Pretty interesting stuff. I’ll make a more informative post when I feel like I have something significant to say about them. The canals are gorgeous. I have two drawings that I need to touch up–I’ll post them later on tonight. The yoga apartment was cool, but very solitary. Feels great to have people to chat with and laugh with and just hear footsteps down the hall. It helps my imagination from thinking up horror stories about things that happen in yoga studios to dashingly handsome 22 year olds when they stay in Amsterdam on their year of Watson Adventures…I have quite a few of those if you’re interested.